With the release of the CTR in 1987, Ruf started a tradition of 200+mph automobiles that has yet to be broken. 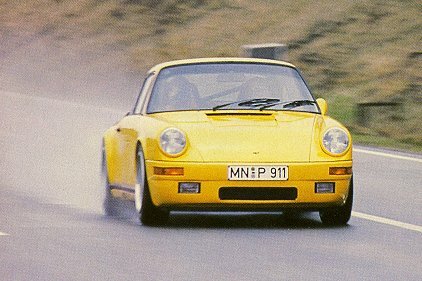 The first of the Ruf CTRs quickly became known as the "Yellow Bird", a nickname given to reflect its bright yellow paintwork. The Yellow Bird is now known throughout 911 circles as one of the most remarkable ever. Many cars were run that day, including a Lamborghini Countach, Ferrari Boxer, and a couple Porsche 959s. By the end, it was obvious: The Ruf had absolutely no competition--even the ultimate Porsche 959 was beaten by over 13mph in top speed! 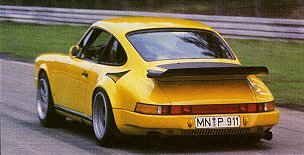 Road & Track's Peter Egan takes up the story: "I buckled myself (with real racing belts) into the spartan interior of the Yellow Bird, which the Ruf people had taken to calling it; the Ruf Twin-Turbo. I held onto the built-in rollcage as Paul Frère accelerated onto the track, and I was absolutely astounded by the acceleration (no easy feat after a day in Ferraris, Lamborghinis, etc). At each gearshift the Ruf went slightly sideways, only to straighten for an explosive burst of speed to the next gear, - more like what I imagined a top-fuel dragster to be than a perfectly driveable road car. As Paul hit 5th gear, we blasted past the first timing clock at 311.9 km/h-still accelerating from a standing start! We flattened onto the banking and exploded onto the back straight with the tach at around 7000 and the speedometer showing 340. My God, I thought, these are Indy speeds. The yellow Ruf pegged its 350-km/h speedometer and howled past the clocks with 336.1 showing on the board: 209 mph. Paul looked over at me with a slightly manic grin and shouted over the earsplitting roar of the engine, "This is faster than I've ever gone in my life!" Not the kind of thing you hear every day from a former Grand Prix driver and Le Mans winner who test drives every conceivable kind of car for a living. I must say, it's pretty extraordinary to take a car you can drive on the street and go this fast. How fast is 339 kilometers per hour in miles per hour? Two-ten or so? Amazing!" Back in the pits, Alois opened the door and asked fast we'd gone. Paul told him in German. A murmur of approval broke out in the crowd, along with applause. The teen-aged son of Michael Gabel looked through the window at our instrument panel and exclaimed, "Mit Radio!" More applause. Later, with the track completely dry, the yellow car went even faster. On its last run of the afternoon, Phil Hill took photographer John Lamm out for a few laps and recorded a trap speed of 339.8 km/h, or 211 mph. That stood as the fastest speed of the day. 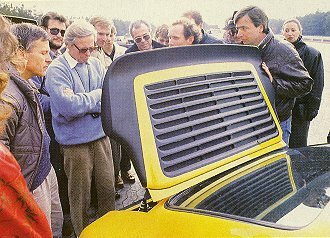 But even more remarkable than that jump to the Ruf's 211 mph top speed was that Phil, Paul and Alois Ruf all agreed that the yellow car was undergeared. "We could make it go faster, " Ruf said, "but there's not much purpose in a road car going very much faster than 300 kilometers per hour. But 300 kilometers per hour is the magic speed in Europe. And in the U.S., 200 miles per hour is the important number, so we tried to go faster than that." With change, I thought."